You can create your own signature style by adding few pieces of highlights following the lines of cut and through layers. Keep your style casual by overlapping small chunks of hair and keep them in shape with small amount of finishing paste. 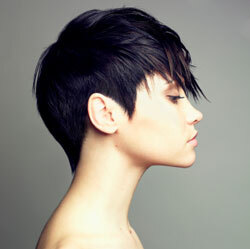 Dark brown short hair that been colored with blue-black or aubergine black and highlighted with few contrasting pieces of caramel and copper highlights right through the fringe.